As thousands of Armenian children packed their bags for summer getaways, our extracurricular group students find inspiration back at school. With sparkling eyes and beaming smiles, they hurry to class to paint, to learn Armenian folk music and to prepare songs and dances for performances. They especially love exploring topics such as the motherland, religion, sightseeing, favorite cartoons, and animals. 50 children from the Artsvaberd village attend the newly established hobby group of national song and music supported through the FAR’s Breaking the Cycle of Poverty Program (BCPP). * BCPP aims to eradicate child poverty in 16 communities of the Berd region through a number of initiatives, including the establishment of after-school groups [painting, embroidery, dance and music, art and crafts] for hundreds of school-age children. Recently, our hobby groups from the Movses, Artsvaberd, and Tavush communities performed concerts and exhibited their visual works to showcase the students’ multifaceted talents. Siramarg Aydinyan has been supervising a group of 26 children for the last three years. She travels a distance of about 10 miles from Berd to Movses twice a week to give painting classes to her talented students. She confirms that the after-school group initiative has ignited the children’s interest in art and has boosted their confidence. “We had an event last month that allowed our students to demonstrate their paintings on spiritual and patriotic topics. They did a wonderful job in graphics. Even our own Father Abel Kartashian enjoyed the exhibition,” proudly remarks the young teacher. The June concert at the Artsvaberd school projected a national idea – “Keeping National Values High.” Students from different grades performed national, folk, and patriotic songs. They even decorated the classroom with national ornaments and symbols. In her welcoming speech, the teacher, Anna Avetyan, highlighted the importance of the newly opened group that, in addition to nurturing the students’ creativity, also teaches them essential social skills. The students of the Tavush extracurricular group kicked off their summer holidays by holding a beautiful exhibition. During the event, art teacher Armine Arzumanyan eloquently talked about the importance of FAR’s initiative of creating a new arts space for the community children. “This is a grandiose day for me, as together with my students, I can also share my abilities as an art teacher,” said Armine. The exhibition brought together thousands of people – community members, teachers, and parents. 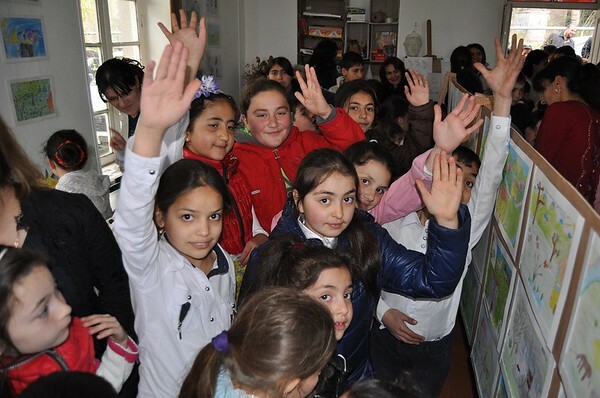 “Through these extracurricular groups, FAR has been trying to make the children’s daily lives a bit more interesting, by allowing them to develop their passions alongside like-minded peers and expert teachers,” said FAR Education and Science Manager Eduard Karapetyan. *Breaking the Cycle of Poverty Program (BCPP) is a multidimensional FAR project addressing child poverty in the region of Tavush, sponsored by the Edward and Helen Mardigian Foundation.